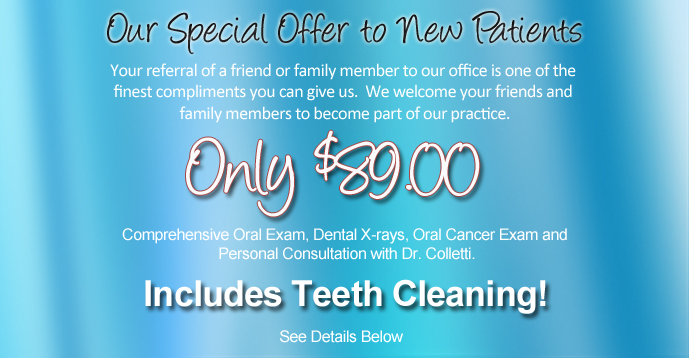 We are delighted to welcome you to Colletti D.D.S. and are pleased that you have chosen us to care for your dental needs. We appreciate the opportunity to serve you. Your first visit to Colletti, DDS involves a few special steps so that we can get to know you. To understand what to expect, please read through this page. You'll find all the practical information you need, such as a map and directions to our office, appointment policies, practice hours, payment policies, insurance acceptance and more. You can also save some time by printing out and completing the patient forms in advance of your appointment. If you cannot find the information you need, please do not hesitate to call us at 630-620-8304. Please click on the link below and complete the online registration form. One of our team members will contact you as soon as possible to discuss your personal needs and help you schedule a convenient time for your first appointment. For your first time meeting us, please come 15 minutes prior to your scheduled appointment time to complete a health history documentaion. In addition, please bring a list of current medications and dosages. Thank you for your preparation! Our mission is simple, to help you make educated decisions about your oral health and maintain healthy teeth and gums for life. The following paragraphs provides you with practical information about our practice. It includes descriptions of our office location (including a map and directions), hours, appointment scheduling, insurance acceptance and billing policies. Our office provides easy scheduling to accommodate you and your family. With multiple daytime, evening, and Saturday appointments, we can serve even the busiest of schedules. We do ask that all appointments be scheduled through our scheduling staff and at least 24 hours notice be given if an appointment must be changed. We understand that dental emergencies happen in the most unlikely and inconvenient of times. Our office is dedicated to giving same day appointments to all dental emergencies. In addition, we have a 24/7 emergency line for non working hours emergencies. Please call for any additional information. We accept all traditional PPO insurance plans. Due to the significant number and variances of dental insurance, please contact our office to verify acceptance and benefits of your individual plan. We are able and willing to send out pretreatment estimates for your dental work to help you financially make the best decisions about your oral health. Michael T. Colletti, DDS does not participate in HMO based insurances; however, we are happy to file insurance for your reimbursement as long as you are free to choose your own dentist! We accept checks, cash or credit cards. We also offer flexible payment plans and financing through Care Credit (see below). Please speak to our Financial Coordinator for your individual needs or questions.